2003–2015. Acrylic on canvas board. 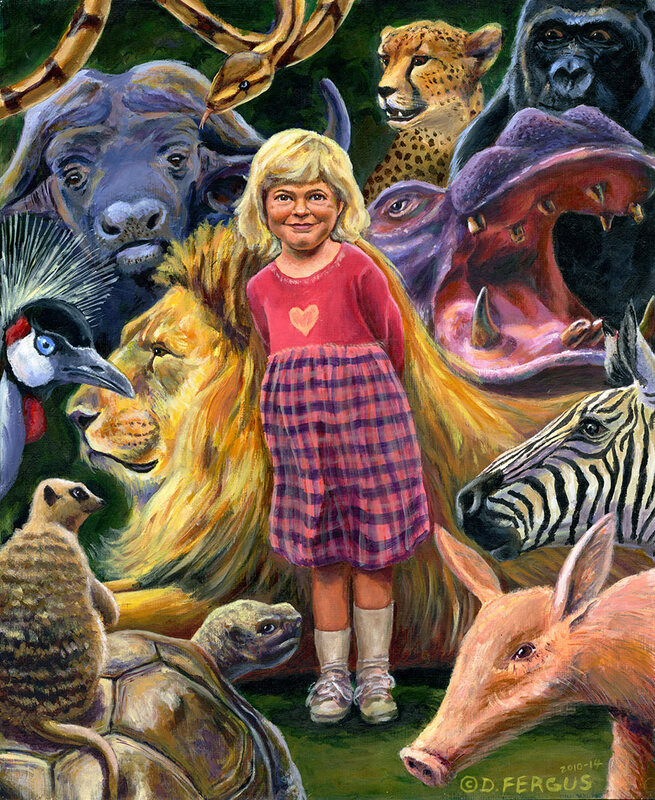 14" x 17"
A couple of years after I completed Rachel’s Menagerie I started work on a similar painting of my other daughter. However, before I could finish it I became sidetracked by...well...life. In the years following I twice pulled it out with the intention of finishing it, only to stall again. But finally, in 2010 I got around to finishing it...almost. I thought I was done, but there were a couple parts I wasn't quite satisfied with. So after staring at it for several more years, I took it down and repainted the offending sections. Now it's finally done. I think. I had originally intended to use a completely new set of animals (ones not used in Rachel’s Menagerie ), but Ellie really wanted a zebra in her painting too. So I acquiesced.